An International Cafe experience like no other. 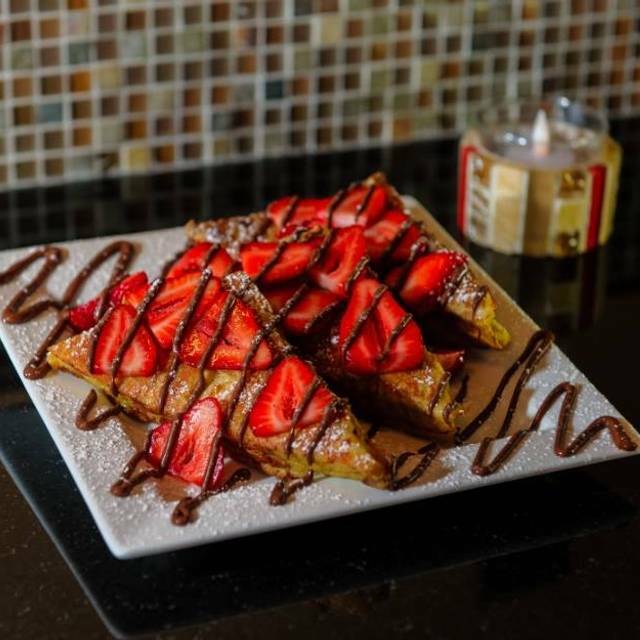 We offer breakfast, lunch, dinner and our crepes are exceptional. A European cafe with a truly eclectic menu, one would be hard pressed to find a menu offering as many freshly prepared items. P.S. Pair your favorite Champagne with our non-alcoholic mimosa mixer or BYO favorite wine, combined with our weekend brunch to perfectly cap your weekend. This place was a great find! I've been trying to find somewhere to eat a healthy breakfast without breaking the bank. This was the place! Can't wait to go back. I love the food and the waitstaff. They are so helpful especially with people with food allergies, explaining how the kitchen is open but they can cook food in separate pans. For someone like myself with moderate food allergies, one of the first things I look for in a restaurant is how accommodating they are. Crepes are by far the best thing ion the menu. Young, upbeat vibe. Interesting menu with LOTS of healthy choices including apps, salads, sandwiches and hot entrees. Oh, and those dessert crepes...my goodness...delish! Best crepes, wonderful selection of tea and coffee/warm beverages. Love coming here for brunch! All the food was amazing, the menu had so many great options it was hard to pick one. Had options for no food restrications as well as our friend who is gluten free and vegan. Delicious brunch. Lovely server. Can’t wait to go back. I always enjoy the food and ambiance at Kafe Neo. It’s a mix of eclectic coffee house and casual dining. Always a great experience. Service was excellent. Food was good but not super plentiful for the price. Coffee and tea were excellent but very pricey, $4.50 for a pot of herbal tea?? food and coffee are fantastic. A great lunch of breakfast spot but be prepared for it to be crowded and noisy. Tables are extremely close together so not a lot of privacy. I enjoyed my salmon and crepe for dessert. I will be returning. First time being at Kafe Neo and enjoyed it very much. The food was very good and the service was great! Will recommend Kafe Neo to all my friends! Perfect for lunch. You are in and out. When I came in the host didn’t check my reservation even though I told him I had a one. So I didn’t get my points for Open Table. It seemed that the staff was a bit distracted. I came before the place got busy. The food was good but the server seemed to forget to come back after we got our food. It was a holiday so I think that had something to do with it. I’ve been here before but Service was impeccable my first few times here. Maybe they didn’t have any “adult supervision” that day? I usually love this place, but today was disappointing. My boyfriend asked if there were onions in what he ordered-the waitress said no and there was. He has an allergy. I was really upset, because she didn’t even check-this could be a serious problem. They gave us the meal for free, but he was sick the rest of the day. Always be safe and check when someone has an allergy, please! I was expecting more.. Crepes were good but the regular breakfast items fell flat. I have been to much better at similar price points or less and had better. Maybe it was an off day but my first impression is just Meh. I will give them another chance in hopes the next food experience will be better. Great ownership. They really care about the customer experience and make it a family interaction. Food quality is always excellent. The new menu is a great add on as well. They actually asked us to wrap it up because they needed the table. Granted we were there almost 2 hours but there were 6 of us and we all ordered food and coffee. We were there to relax and catch up. 2 hours is long but it should come to be expected somewhere that specializes in coffee and tea. Nothing says “relax, stay a while” quite like coffee. Yet, that’s not what you should expect here. Really disappointing. The service was good. The food was very tasty and we will definitely be back. Was sat right away. Hostess friendly. Server was excellent. We enjoyed the food. The food, service, and staff were great. Our waiter was super friendly, helpful, and attentive to our requests. Great experience all around. Met a girlfriend for lunch. The location was convenient for us and was close to Rt 80 and Rt 46. The crepes and strawberry salad we had were delicious! We weren't rushed. The wait staff was attentive. Would go to Kafe Neo again. Food was good; crepes were a different approach to a meal. Service was a bit slow and some items ordered never made it to the table, although Server was friendly and helpful. Been there a few times...worth going back. Great staff and food. Just a great experience. I would recommend without exception. Set in a strip mall...small dining space...people waiting for tables encroach on patrons tables...kitchen service very slow...food very good...wait staff pleasant...recommend reservations exclusive for Sunday brunch. Great food always! Unique crepes and dishes I love to try something new every time I go. It is a bit loud so if your meeting someone you haven't seen in a while and wanna catch up I would consider going somewhere else because it's hard to have a conversation here. I get the to food to pick up often and their online ordering is convenient and fast. We love Kafe Neo! One of our favorite places for food that's good, different and fun!